Though it’s been over 800 years since the last time a new Benedictine monastery opened in the Rostrevor area of Northern Ireland, the monks of Holy Cross Monastery are not complete strangers to the region. Visit the Benedictine Monks Rostrevor on Facebook or at their website. WHO WAS SEEN on the big screen and who was a bouncer? You've heard about Pope Francis' prior work sweeping floors and as a bouncer right? If not, you can read the Catholic News Service report here. Surely, you've seen the Huff Post article of the Pope joining his Almoner at night giving alms to the poor of Rome no doubt, correct? Read more on this rumor that is "probably true" from "a knowledgeable source in Rome [that] told The Huffington Post that "Swiss guards confirmed that the pope has ventured out at night, dressed as a regular priest, to meet with homeless men and women,"" here. Perhaps you haven't heard of Mother Dolores Hart, OSB who before becoming a cloistered nun, played opposite to Elvis Presley in "Loving You." Relish in Mother Dolores Hart's journey toward her true vocation as she reflects that "The extravagance of my Hollywood career only mirrored the extravagance of God’s creative love expressed through His Son." Read the full USCCB blog here. Discover more about the Benedictine communities here. It was a quote from action-movie star Bruce Lee which helped inspire Philippine Archbishop Socrates Villegas to enter the priesthood. Ten days after the devastating Typhoon Haiyan killed thousands of people, the relief efforts continue to pour in to care for those displaced near Tacloban City, eastern Leyte, and Samar Island. National Catholic Reporter details the stories of endurance and aid provided by religious communities, including the Carmelites of Cebu and Ormoc, a Claretian novitiate compound, and the Religious of the Sacred Heart. Read the full article here. Remembering women religious in month of "All Saints"
Elizabeth Ann Seton, Catherine of Siena, Hildegard of Bingen, and more to come this month on the VISION Vocation Network Facebook page. Speaking of creative ways to engage students' interest, Kent's work reminds me on a smaller scale of the stories my grandmother would tell me of her and her sisters' time as students of Immaculate Heart College in the 1920s—now Immaculate Heart High School—especially the memories of my great aunt, Sister Margaret Irene, also a former Immaculate Heart nun, teaching with castanets borrowed from her flamenco lessons as a young girl. What other "hats" have you seen religious women wear besides the obvious "religious service to others and God" hat? and her 1985 USPS Love stamp design. America Ferrera, Emmy-award winning star of "Ugly Betty," is set to play a nun-lawyer who practices on behalf of the least fortunate in a new CBS TV series, according to Deadline. The plot for "Damascus" may seem a bit unconventional for primetime, but it actually sparked a bidding war between networks. Woo-hoo! Let's hope it is not too cliche-ridden and actually captures the great work Catholic sisters do on behalf of the poor, including representing them in court. According to the BBC Religion and Ehtics article "Lindisfarne Gospels: Why is this book so special?" Bishop Eadfrith is said to have copied and decorated the Gospels on his own. The manuscript “contains the oldest surviving English version of the Gospels and escaped Viking raids and turmoil - required time, dedication, and the invention of new tools and materials." Read the full article above and view the exhibit link here. Did any of our followers see this exhibit in Durham? Tell us about your experience in the comments section below. Sister Camille D’Arienzo celebrates 20 years of Cherish Life Circle at an anniversary event Sunday October 6th. On October 6, 2013 at 3 p.m. at the Convent of Mercy in Brooklyn, N.Y. Sister of Mercy Camille D'Arienzo, R.S.M. and the Cherish Life Circle will be celebrating 20 years of "upholding the sacredness of all life." Joining them will be Sister Helen Prejean, S.S.J,. anti-death penalty activist and author of Dead Man Walking, as well as Kevin Doyle, New York State's last Capital Defender. The members of the Cherish Life Circle work to eliminate the death penalty, comfort those who have suffered the loss of murdered loved ones, and promote restorative justice for offenders. Read Jim Dwyer's of New York Times feature, "Ministering on Death Row, and Feeling a New Confidence in Rome" and Sister D'Arienzo's award-winning essay for VISION magazine and the VISION Vocation Network, Called, and called again as well as about the Sisters of Mercy of the Americas. THE CHERISH LIFE CIRCLE sells Christmas cards desgined by a death-row inmate to help raise funds for institutions which help children in a number of foreign countries as well as the U.S. NOVICES! SHARE YOUR STORY with HGTV's new show new house, new life. HGTV’s, latest series, new house, new life seeks fun, high-energy, people who have or are in the process of changing their current status for a lifelong passion. In particular, they are looking for novices preparing for religious life. Casting applications are being accepted now and production will continue through the fall. Ideal candidates will be outgoing people who would love to share their life-changing vocational and discerning experience with HGTV’s audience, inspiring others to pursue their dreams of religious life or spiritual fulfillment and service. For more information please contact: cbaggish@orionentertainment.com, 720-259-1546. Which form of religious life is most popular and other fun facts . . .
Have you ever wondered who is considering a vocation to consecrated life? Who is answering THE CALL? Well, you are in luck! In the past year nearly 5,000 people completed a Vocation Match profile. How old are they? What kind of community interests them? Where do they live? Check out our cool new infographic below (click here for a larger version of the graphic). Brother Nich Perez, CSC, at Holy Cross College in South Bend and his crew have an exciting new project: A full-length documentary on religious brothers or/and monks in the Catholic Church, from different parts of the world, living a life of chastity, poverty and obedience. Check out the official trailer for BRO Men WIth Hope To Bring, below that recognizes the tremendous work of these men on a mission. BRO Men With Hope To Bring Official Trailer from Nich Perez CSC on Vimeo. The Sisters of Bon Secours in Marriottsville, Maryland, hosted a picnic last Saturday as an opportunity to honor the Virgin Mary as well as a time to faith-share and break bread together with the sisters. Bon Secours Sister Pat says on her blog, “Well, Mary inspired us to do the simplest of things – to break bread together and to share what was closest to her heart 2000 years ago (and today) and that is to simply to say “YES” to God. So, the idea of having a picnic in her honor and inviting young adults to come and share how God is acting in their lives was born.” Not to worr: The sisters will continue this tradition by hosting another opportunity in the spring as a hike and picnic to nearby waterfalls in Marriottsville. The sisters asked those who attended to reflect on: “where God seems to be in our lives.” Not a bad question to ask ourselves today as well. Discover more about The Sisters of Bon Secours in Marriottsville, Maryland and read more of Sister Pat’s blog about the picnic with Mary. Sundays are for . . .
says Father John Herman, C.S.C. For this throwback Thursday I think it is fitting to throw a “Hail Mary” here and remember the true purpose of Sunday mornings. While we are in the second week of the NFL season, let’s set our fantasy football teams to the best combination of players we have and then leave it and head to Mass. Father John Herman, C.S.C., touched upon the importance of Sundays Eucharist this last October (2012), in his blog piece: Nothing Better than Sunday Mornings. Heshares his love and gratitude for God calling him to become a Holy Cross priest aswell as a glimpse into his life of blessings and challenges as pastor of La Luz Parish in México. Fr. Herman says: “One of the things that helps me feel very grounded in celebrating the Eucharist here is the connection that I’m developing with the people after being here for a little more than a year. I see Imelda out there and know that she’s suffering greatly from the tragic and violent death of her daughter. I see Pablo and Carla who are expectantly awaiting the birth of their first child. I see Arturo and know how he and his family are struggling to keep their family business going. I see Edgar who is discerning a possible vocation to religious life and priesthood in Holy Cross. Learn more about the Congregation of the Holy Cross. Sister Joan, who has sold over 1 million copies of 40 books on the spiritual life, says has “a disease called justice. I can spot injustice at a great distance and feel compelled to confront it.” The community's recent projects include The Grove, "an urban farm with 65 raised beds that will provide fresh produce for the poor, and serve as an outdoor classroom for teaching gardening techniques,” as well as Sister Joan’s "newest and most cherished project,” a virtual monastery called “The Monastery of the Heart” which gather people together on the internet in prayer and community. Read the full interview transcript or watch the PBS interview here. "Pope Francis renewed his appeal for peace in Syria and throughout the world on Wednesday, once again inviting Christians of every denomination, believers of every religious tradition and all people of good will to take part in the worldwide fast and vigil of prayer and penance for peace, which he has called for September 7th, the vigil of the Feast of the Nativity of Our Lady, whom we venerate as Queen of Peace. First announced at the Sunday Angelus at the start of the week, many local churches have already organized their own initiatives to mark the day. The Holy Father especially urged the faithful of Rome and pilgrims to the city to participate in the prayer vigil to be held in St. Peter's Square starting at 7 p.m. Rome time and continuing until midnight. 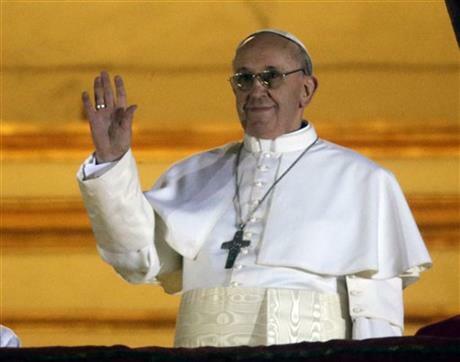 The Holy Father concluded, 'May a powerful cry for peace go up from every land!' "
From the pope's message: This coming Saturday we will live together a special day of fasting and prayer for peace in Syria, the Middle East, and throughout the world. I renew the invitation to the whole Church to live this day intensely, and even now I express gratitude to the other Christian brethren, to the brethren of other religions and to the men and women of good will who desire to join in this initiative, in places and ways of their own. I especially urge the Roman faithful and pilgrims to participate in the prayer vigil here in St. Peter's Square at 19.00, in order to ask the Lord for the great gift of peace. May a powerful cry for peace go up from every land! Raise a glass to the brewing monks! Near the birth place of Saint Benedict in Italy is the Monastero di San Benedetto just outside of Rome in the Umbrian town of Norcia, where the Benedictine monks have been hard at work successfully brewing beer for a year. The brew serves as a “a spiritual gain for them [visitors], even though they are not looking for it,” said the director of Birra Nursia, Father Benedict Nivakoff, O.S.B., in the YouTube video from Catholic News Service. Cheers to the work of the Benedictine monks! From "Faith" by Patrick Carroll in the July/August 2013 issue of PIME World (p.18). More about the PIME Missionaries (the Pontifical Institute for Foreign Missions). "THERE ARE a handful of young people across the country who have interpreted 'calling' in perhaps the most literal way possible." A couple of articles in the news this past week have addressed this question of calling, purpose, and vocation. "There are a handful of young people across the country who have interpreted 'calling' in perhaps the most literal way possible: By devoting their lives to the Church. The decision seems radical in the context of common stereotypes about millennials, a generation often accused of lack of discipline, skepticism bordering on snark, preference for a hook-up culture, and only the vaguest spiritual impulses. These millennials defy those clichés, taking lifelong vows of poverty, chastity, and obedience to God—and to the Catholic Church, which, especially in their lifetimes, has been regularly plagued by scandal. Sister Colleen Gibson, a 27-year-old in the second year of her formal training with the Sisters of St. Joseph of Philadelphia, took the quiz on a website during college to determine what the best path might be for her. "It's like Match.com, but for religious communities," she explained. After identifying some of the aspects of religious life that appealed to her, she clicked a box to send her answers to various orders that might be a fit. "The next morning when I woke up and opened up my inbox, there were 40 emails—it scared me to death. It's like throwing red meat into a lion's den." In time, obviously, Sister Colleen found the community with the best fit, and her may options gave her the chance to look at different kinds of communities. The website Sister Colleen searched is the VISION Vocation Network's very own Vocation Match survey! Second, on the Huffington Post Agapi Stassinopouslos posted a blog item regarding the topic of "purpose" and "calling" in her piece "5 Essential Questions to Lead You to Your Calling." ", , , When we connect to our heart's calling," Stassinopouslos says, "everything starts to have meaning. So I have come up with five questions that as you answer can bring your calling closer to you. "What am I here to learn? What am I here to express?" Sister Julie Vieira, I.H.M., cofounder of A Nun’s Life Ministry wrote the following blog "about the Catholic sisters, nuns, and monks in Kentucky who have peacefully but firmly stated that they will not allow their land to be used for a natural-gas pipeline proposed by energy and pipeline companies." Read more in her "Religious taking a corporate stance" blog posting and the background of the story from The Courier-Journal. unload bread and other bakery Goods during a delivery. The Alexian Brothers (C.F.A.) in St. Louis are featured in The Alexians magazine for their work with their “Loaves and Fishes Ministry.” The year-old ministry is growing rapidly and serving many homeless and needy throughout the city of St. Louis. Brother Thomas Klein, C.F.A. started the ministry in May 2011 after his barber asked him if he knew of anyone who could use some extra bread. When Brother Thomas was reassigned temporarily last summer to Signal Mountain, Tenn., Novice Brother Andrew Dinegar, C.F.A., along with Novice Brother Paul Magner, C.F.A., have helped develop, sustain, and network to provide for the continued success of the ministry. “There’s such a great need out there,” Brother Andrew says. The ministry fits the Brothers’ mission and reflects their values “to a ‘T’ . . . . Going back 800 years to how the Alexian Brothers started by serving the poor . . . it’s coming full circle." Learn more about the Alexian Brothers. World Youth Day Madrid 2011 priest in prayer. From July 23 until the 26, from 8 in the morning until 8 at night at the Quinta da Boa Vista site of World Youth Day Rio2013, pilgrims will have the opportunity to visit confessionals specifically designed for WYD, along with a tent of 600 square meters for adoring the Most Holy Sacrament, participate in catechesis, eat at the food court and various restaurants, and even visit tents with DJs and finally Evangelization 180º, with extreme sports like climbing and zip-lining. Read further here. Is there an upcoming Vocation Fair in your area? Share the information of date, time and location below. Giving Voice is a peer-led grassroots national organization of Catholic sisters under the age of 50 which creates spaces for younger women religious to give voice to their hopes, dreams, and challenges in religious life. The July conference is the seventh national gathering of younger women religious organized since 1997 and the first to take place on the West Coast. Previous gatherings have taken place in Boston, Chicago, Cleveland, and Milwaukee. Contact Sister Susan Francois at 425-233-7280 to arrange a phone interview with sisters in their 20s, 30s, and 40s. Not content to safely sit out the battle, about 16 Sisters of Charity of St. Joseph, as they were then known, headed to Gettysburg [from their motherhouse in Emmitsburg, Maryland] to nurse the wounded. As they arrived, they encountered the horror of war. Sr. Marie Louise Caulfield wrote that she saw "thousands of guns and swords lying around. ... further on we saw many soldiers on horseback as silent almost as the dead who lay there ... The rain had filled the roads with water, and here it was red with blood. Our carriage wheels rolling through blood! Our horses could hardly be made to proceed on account of the horrid objects lying about them." On the battlefield, and later in area hospitals, the sisters cared for the medical and spiritual needs of both Catholic and non-Catholic Confederate and Union soldiers. According to Denise Gallo, provincial archivist for the Daughters of Charity, the care from the sisters was so good that many of the soldiers actually cried when they learned they were going to be transferred to other hospitals. The love shown by the sisters melted even the most hardened hearts. In the context of anti-Catholic sentiments of the time, Gallo reported that some of the soldiers said, "And these are the people that we insult" who are being so kind and loving to us. Lumen Fidei released July 5th 2013. On July 5th Pope Francis released his first encyclical, “Lumen Fidei” (“The Light of Faith”). It is a celebration of Christian faith as the guiding light of a “successful and fruitful life”, inspiring social action as well as devotion to God, and illuminating “every aspect of human existence”, including philosophy and the natural sciences, as catholicherald.co.uk shares their overview here. Our friends at the Huffington Post point out here the importance of both Popes contributions in the completion of the encyclical. As Pope Benedict had nearly completed the work before his resignation February 28th, Francis took up the unfinished work, adding a “few contributions” to Benedict’s “fine work” and publishing it under his own name. Finally, the National Catholic Register gives us a great concise outline of 14 major points about Pope Francis’ first encyclical here that can serve as a reference while reading the 82 page papal document. Pope Francis' homilies on video, talks and tweets, webcams from Rome, and activities and events--all on the Vatican's first official iOS and Android app, Missio, and it's free. As we are at the 35 day countdown to World Youth Day 2013, in Rio De Janeiro, The United States Conference of Catholic Bishops wants you to follow them on twitter @wydusa! This is a great way to receive updates, links, and creative and/or inspirational messages whether you are a group leader, pilgrim or follower from home. Let’s stay connected to the latest news, share and retweet in our own circles of influence in solidarity as our prayer for this upcoming World Youth Day. Pope Francis greeting the American crowd at St. Peter's Square. Catholic sister among peace protesters convicted as saboteurs against the U.S.
Anti-nuclear peace protesters, Holy Child of Jesus Sister Megan Rice SHCJ, Greg Boertje-Obed, and Michael Walli, were originally charged with trespassing on federal property when they cut the fence at a nuclear plant in Oak Ridge, Tennessee and painted peace slogans on the nuclear silos. But after the government faced embarrassing questions about the lack of the security at the plant, the charges were changed dramatically. The three non-violent offenders, including the 83-year-old Sister Rice, have now been convicted of acts of terrorism and face a minimum of 10 years in prison. They are currently imprisoned in a federal jail in Knoxville awaiting sentencing on September 23, 2013. Read more here and here. Sign the petition to Attorney General Eric Holder here. Learn more about the mission and work of the Society of the Holy Child Jesus. life-giving alternatives, to build true peace." If only the walls—or maybe the ground underneath the foundation—could talk . . .
Father Kurt Hartrich, O.F.M., pastor of St. Peter's-in-the-Loop in downtown Chicago, operated by the Franciscans of the Sacred Heart Province, had the excellent idea of devoting part of his weekly church bulletin message for the Sunday of Memorial Day weekend to recall some memories of what had been previously on the Madison Street site prior to the erection of the beautiful Art Deco-style church in 1953. Up until a few weeks ago, the only thing I knew about the property on which our church was built was that the LaSalle Theater had previously occupied this site and had closed several years before we bought the lot at 110 West Madison. But this property had a much longer and storied history than just a movie theater. John J. Coughlin was the proprietor of a bathhouse in the basement of the Brevoort Hotel at 143 W. Madison (now 118 W. Madison) in the 1880s. Just a few years later in 1892, with powerful backing from Chicago gambling king Mike McDonald, “Bathhouse” John became Alderman for the richest single district in the world, Chicago’s First Ward, a position he held for 46 years until his death in 1938. During that time, he was not only the city’s most famous politician, but he presided over—and profited from—the greatest red light district in American history, the Chicago Levee. Coughlin was born in 1860 in Connelly’s Patch, an Irish neighborhood on the West Side of downtown, between Madison and Adams Streets. With only a few mediocre years of schooling, he began working at the age of 11 as a rubber in a Turkish bathhouse, learning the trade and saving fastidiously. By 1887, he had earned enough to buy the bathhouse in the basement of the recently refurbished Brevoort House hotel on Madison Street. The Brevoort, one of Chicago’s oldest inns and always one of the best furnished (it was the first in Chicago to offer an elevator), was rebuilt after the Great Fire as an eight-story high premier European-style hotel and offered its visitors what was at the time considered a true luxury—the opportunity to take a bath. Together with Alderman Michael “Hinky Dink” Kenna, he ruled the First Ward, selling protection to the brothels, gambling houses, drug dens, white slave operations, and saloons of the Levee for over 40 years. He was part owner of Frieberg’s Dance Hall and employed his business partner, Ike Bloom, as the official collector of tribute. Later, Bloom’s position was taken by “Big Jim” Colosimo, the founder of the Chicago Outfit, which Al Capone would run later. Nearly every famous Chicago criminal of the early 20th century got their start working under Coughlin and Kenna. In his later years, while he continued to sit on the city council, Coughlin largely became a doddering figure-head for the Torrio-Capone syndicate, a kindly old gentle-man who enjoyed telling stories about days gone past. Bathhouse John passed in November, 1938. Having lost tens of thousands of dollars on his racehorse hobby during the last decades of his life, Mr. Coughlin left only a meager $25,000 to his family in his will. Who would have ever thought that the land on which our church now stands would have such a storied history? I’d like to think that, since 1953 when St. Peter’s opened, we have made quite a difference in the reputation of this part of the Loop! Evangelizing is going viral with Catholic memes. ordination in May of last year. On May 5th 2012 Ducanh Pham was one of three Franciscan Friars from the Sacred Heart Province to be ordained to the priesthood. Happy one year anniversary, Father Pham, O.F.M.! Here is a look at the celebration of the ordinations at St. Peter’s Church in Chicago, IL. Perhaps you remember Father Duc Pham as Brother Duc Pham as VISION featured him in this article that described his journey to the Franciscans as being “tricked” into it by God. As a young girl, I remember reading books like Babysitters Club or The Magic Tree House but nothing like a book encouraging me to seek or explore the call to religious life. Perfect timing, since Sunday (April 21) was the World Day of Prayer for vocations. When they could not find stories about vocations for children, Fr. Jeff and Peggy Wertz decided to start writing their own books. In 2010 they published, Becoming Fr. Bob,for boys, which quickly became a success. This January, during Catholic Schools Week, they released their latest book, aimed at elementary and middle-school girls: Becoming Sister Mary Grace. “Principal Peggy Wertz and I worked alongside a great illustrator and saw Becoming Sister Mary Grace come alive,” said Father Kirby, vicar of vocations for the Diocese of Charleston, S.C. Wertz is principal of St. Mary Help of Christians School in Aiken, S.C., where illustrator Alice Judd is an art teacher. “We want this book to be attractive to young girls, as well as middle-school girls,” Wertz said, explaining how the cover pictures Claire, the focus of the story, with her little sister. The little sister is the cause of Claire’s excitement as the story opens. With their mother expecting a new baby, this is Claire’s chance to become a big sister. “We felt all of the youngsters in the country would identify with becoming a big sister,” Wertz said. It was also a nice way to talk about perhaps becoming another kind of “sister” someday. The book is dedicated to the girls who were part of the St. Cecilia Vocation Club at Mary Help of Christians School when the book was begun. Those girls are now juniors and seniors in high school. Natalie Gorensek, a junior, was really excited at the launch of the book and stated that, “Everyone knows about marriage and priests, but not everyone knows about nuns. So it’s important we have vocation clubs to get the word out that being a sister is interesting and cool. … Knowing other options (of vocations) is really helpful in spiritual development." To read more about the book Becoming Sister Mary Grace, check out the artilce published in the National Catholic Register and let us continue to pray and encourage vocations throughout the world. World Youth Day 2013 in Rio De Janeiro, Brazil will be here before we know it! How are you preparing? How are you celebrating? Read how many pilgrims celebrated the 100 day countdown here. Christ the Redeemer will watch over millions of pilgrims for World Youth Day events this July. Looking for spiritual exerice? Make the effort to view the statue up close. It is one of the most visited attractions in the world and was voted among the Seven Modern Wonders. This past fourth Sunday of Easter (April 21st), also known as Good Shepherd Sunday, marked the 50th Anniversary of the World Day of Prayer for Vocations. Pope Francis’ celebration included the ordinations of 10 new priests in the Diocese of Rome. PART of the crowd at a Mercy Shrine festival. Divine Mercy Sunday weekend festivities, April 6-7, at the National Shrine of The Divine Mercy, home of the Marian Fathers of the Immaculate Conception on Eden Hill in Stockbridge, Mass. Attend along with thousands of pilgrims. Volunteer. Holy Thursday foot washing rite. Holy Thursday marks the first of the three holiest days of the Triduum leading us to Easter. The events of the day now and in Jesus time keep true to an action packed celebration. Simply put, Holy Thursday remembers the Last Supper of Jesus Christ with his Apostles. Catholic New Agency beautifully reflects on this complex and profound celebration that also celebrates the institution of priesthood. Britain’s Queen takes part in Maundy Thursday by giving Maundy coins to deserving senior citizens. Pope Francis humbly serves the poorest of the poor by washing the feet of twelve juvenile inmates that mirrors Jesus’ washing of the twelve Apostles. How will the actions of the events of the Last Supper come alive for you today? How will you live the new commandment to love one another? Rome will be the destination for an international pilgrimage to the tomb of St. Peter, July 4-7 for novices, seminarians, and those on a vocational journey. Part of the Year of Faith activities, the event will include visits to Christian sites, prayer, celebration, worship, and vocational testimonials and will culminate with Mass led by Pope Francis in St. Peter’s Square. Registration is required; find out more online. From a story by Veronica Scarisbrick on Vatican Radio: Pope Francis has chosen the motto Miserando atque eligendo, meaning "lowly but chosen," which in Latin means "by having mercy, by choosing him." The motto is one the pope had already chosen as a bishop. It is taken from the homilies of the Venerable Bede on Saint Matthew's gospel relating to his vocation: "Jesus saw the tax collector and by having mercy chose him as an Apostle saying to him: Follow me." This homily, which focuses on divine mercy and is reproduced in the Liturgy of the Hours on the Feast of Saint Matthew, has taken on special significance in the Pope's life and spiritual journey. It was on the Feast of Saint Matthew in 1953 that a young 17 year-old Jorge Bergoglio was touched by the mercy of God and felt the call to religious life in the footsteps of Saint Ignatius of Loyola and entered the Jesuit order. Beyond the motto, the coat of arms has a blue field and is surmounted by the mitre and the papal keys. On the crest itself at the centre is the symbol of the Jesuits, a flaming sun with the three letters recalling the name and the salvific mission of Jesus. Underneath we have two more symbols: to the right the star representing Mary and to the left the nard flower representing Joseph. Learn more about these communities in VISION's Community Search. With the papal election now underway, the news media are dredging any number of papal-election history tidbits, including one about the longest ever, in 1268, when it took almost three years to elect Pope Gregory X. From that one we get the term conclave - "with key": It was going on so long that local officials locked the electors in with minimal food, water, and amenities to encourage a decision. Times - and accomodations - have changed, and these days cardinals don't take long to elect a pope; no conclave since 1831 has lasted longer than five days (thanks you Fr. Tom Reese, S.J. for that fact). You can follow the Sistine Chapel chimney for the tell-tale smoke by live video and at @PapalSmokeStack or sign up for election alerts at Popealarm.com and at one of many apps, but don't expect any tweeting cardinals. They're all sworn, and I quote their oath, "not to break this secret in any way, either during or after the election of the new Pontiff, unless explicit authorization is granted by the same Pontiff." Interested in how the cardinals vote? How about the conclave schedule? The founder of the Maryknoll Sisters, Mother Mary Joseph Rogers, MM, has been named one of nine American women to be inducted in 2013 into the National Women’s Hall of Fame (NWHF). Mother Mary Joseph, whose “extraordinary achievements were recognized and applauded” by all the judges, according to NWHF deputy director Amanda Bishop, will join the 247 eminent women who have been inducted into the Hall since its founding in 1969. Among others included in this year’s list were Betty Ford and House Democratic Leader Nancy Pelosi. “We are thrilled and honored by Mother Mary Joseph’s selection,” said Sister Janice McLaughlin, MM, president of Maryknoll Sisters, and happy for the recognition it gives to our founder who achieved so much, not only for women religious, but for all American women, at a time when possibilities for them were far more limited than they are today. Mother Mary Joseph drew from a lifetime of spiritual depth when she stressed the need for the sisters to be compassionate women, adaptable and willing to try new ways without fear of failure or censure, according to a release put out by Maryknoll. Above all, she emphasized the primacy of a holy life. Today, Maryknoll Sisters serve in 26 nations around the world, ministering to all people in need. Their numbers include doctors and nurses; authors, artists and dancers; social workers, ecologists and peace activists; theologians and spokespersons to the United Nations.Learn more about the Maryknoll Sisters here. Religion News Service has outdone itself with its "Sweet Sistine" March Madness Pontiff Picks brackets. Make your best guess for first round picks by March 1. RNS March Madness, Sweet Sistine Bracket. Who is your pick for the next Pope? November is named Black Catholic History Month in the United States, but many parishes around the country are celebrating and remembering African Americans with Eucharistic celebrations and reflections in February as well. Firstly, The National Black Catholic Congress newsletter this month features Robert Boxie’s vocation story and journey to Rome from Louisiana. "We hold ourselves accountable to our baptismal commitment to witness and proclaim the Good News of Jesus Christ." Robert Boxie pictured in Rome, Italy where he continues his seminary studies at the Pontifical North American College (NAC). St. Augustine, St. Monica, Charles Lwanga, Lena Edwards Madison, Archbishop Eugene A. Marino, SSJ, Dr. Thomas Wyatt Turner, Daniel Rudd, Pierre Toussaint, Sr. Thea Bowman, St. Benedict the Moor, Llewellyn Scott, Pope St. Victor, Pope St. Gelasius, St. Martin de Porres, St. Rose of Lima, Sts. Perpetua and Felicitas, Nathan Jones, Fr. Joseph Davis, St. Cyprian, St. Catherine of Alexandria, St. Moses the Black, Fr. Charles Uncles, SSJ, Fr. Augustus Tolton, Dr. Katherine W. Cole, Robert L. Robinson, Mathias de Sousa, Bishop Carl Fisher, Archbishop James Lyke. Finally, The Office for Black Catholics, Archdiocese of Chicago, newsletter The Drum, features , “Faces in Black History” and a “What’s Happening this Month” section with celebrations that honor and remember Black Catholics. How are your parishes incorporating Black History Month? How will your parishes remember Black Catholic History Month in November? Show us how you're doing with your Lenten resolve? We are one week into Lent and the VISION editors want to know how you are keeping up with your Lenten promises! Join our Lenten Check-in Photo Contest via our Facebook page and show us your Lenten practice in action. Or enter directly below. We want pictures of those French Fries you aren't eating, or that church you’re making a visit to each morning! The more creative the better. Winner of this contest automatically becomes a contender for the “Best of VISION post" to be featured in the in the next addition of Vision Vocation Guide. You have until March 23rd to submit your entry and will be notified on Holy Thursday if you are the lucky winner. Good luck and get posting! May the best photo win! "White Monks: A Life in Shadows" - Photographs of life within three Trappist monasteries in Spain by photographer Francesca Phillips. PHOTO from "White Monks" exhibition. © 2013 Guardian News and Media. Some samples. The exhibition can be seen at Holy Trinity Church, Sloane Street, London until March 9. We are excited to announce that our friends over at A Nun's Life Ministry have recently launched their newly refurbished website and it is incredible. A Nun's Life Ministry has been working hard to create a website that is accesible and functional for all its users. Today, the sisters will be hosting a LIVE website tour to show off their wonderful new site. The streaming audio and video tour will begin at 6 p.m. Central Time. The chat room will be open too, so you can interact with the sisters and with other folks during the tour. New Podcasts by the Sisters called "Random Nun Clips!" Make sure to check out the website and join the sisters tonight for their special podcast. Way to go sisters!! Our Lady of Socavon statue atop a 12,000-foot mountain south of La Paz, Bolivia, passes the Christ the Redeemer statue in Rio De Janeiro, Brazil by 22 feet to become the “world’s largest Marian statue.” The patroness of miners, Our Lady of Socavon’s original statue is found at a diocesan shrine in the city of Oruro. Our Lady of Socavon, Pray for Us. A footnote to the discovery-of-the-bones-of-King-Richard-III story: He was buried by the Franciscan Grey Friars at their church in Leicester, 100 miles north of London. The church was closed and demolished after King Henry VIII dissolved English monasteries in 1538. A nice reflection from a Sisters of Mercy candidate on "My Journey to Becoming a Sister of Mercy." "I wish my decision to pursue religious life was a single moment that I could describe to you but I grew into it, or maybe it would be more accurate to say it grew into me." Click here to learn more about the Sisters of Mercy. A short film inspires Mary to become a nun. Have you ever been asked to consider religious life? Was there a period of time in your life where you thought about becoming a sister, nun, brother, or priest? Writer and director Teresa McGee recounts this period of time in her own life as the inspiration for a short film, The Mary Contest. An 11-year-old, Mary Kelly, struggles to fit in and finds comfort in Sister Adelia, who invites her to join The Legion of Mary prayer group. It is in the prayer group where the contest to find the most names for the Virgin Mary ensues. Let me know what communities I've missed! Young adults: Losing our religion? "When Jesus came to Nazareth, he 'went according to his custom into the synagogue on the sabbath day' and read from a scroll of the prophet Isaiah," writes Dan Grippo in the "Preaching the News" column for Prepare the Word. "But if Jesus were to speak in a synagogue, church, or mosque in the U.S. today, how many young people would be there to hear him?" asks Grippo. "Dramatically fewer than in previous generations, according to Pew Research Center." According to results of the Pew study, “Nones” on the Rise, one-third of Americans under 30 say they have no religious affiliation, a dramatic increase over numbers from just a few decades ago. Many researchers believe the trend is tied to religion's association with socially conservative politics. "I think the single most important reason for the rise of the unknowns is that combination of the younger people moving to the left on social issues and the most visible religious leaders moving to the right on that same issue,” says Harvard professor Robert Putman, in an NPR interview by Heidi Glenn. For Father Mike Surufka, a Franciscan priest in Chicago, there are indeed issues that are fundamental to the church but what seems to really matter is more basic: that the parishioner's spiritual needs are being met. . . . Surufka says he is hopeful about the future of religions in America. "There was a theologian from the mid-1900s who . . . described hope as an attitude toward the future that we cannot see, but we trust that somehow it's held by God and that there are possibilities beyond what we can even imagine." And Putman points out that, "Even with these recent changes, the American religious commitments are incredibly stronger than in most other advanced countries in the world . . . we are a very religious country even today." What do you think the church can do to encourage a younger generation to encounter Jesus and tap into the spiritual riches of Catholic teachings and traditions? Of those who recently chose to enter religious life, 43% attended Catholic primary school. As we approach Catholic Schools Week, it is fitting to find in a survey report by the Georgetown University-based Center for Applied Research in the Apostolate (CARA) that Catholic schools and colleges influence the choice to become a religious sister and brother. “New Sisters and Brothers Professing Perpetual Vows in Religious Life,” is a report on a survey that was commissioned by the U.S. bishops’ Secretariat of Clergy, Consecrated Life and Vocations www.usccb.org/consecratedlife on the major factors in choosing to enter a religious order of those Sisters and Brothers who professed perpetual vows in 2012. · The average age of those professing perpetual vows is 39 and the age range is 23-66 years for women and 25-62 years for men. Additionally, the average age of 20 is the consideration time for the newly professed while half were 18 or younger when they first considered religious life. · 71% of the class of 2012 was born in the United States and Vietnam is the most mentioned country of those born outside the U.S. The Asian percentage is larger and the Hispanic/Latino percentage is much lower than previous years. · Regarding education, 43% of the class attended Catholic Elementary or Middle School, 36% attended Catholic High School and 33% attended Catholic Colleges. Additionally, 60% of the professed earned an under graduate or graduate degree before entering their religious institute and only 7% report educational debt delayed their application to the community. · 82% of the professed reported prior work experience; 19% worked part time and 63% worked fulltime before entering a community. Furthermore, 72 % of the class were active in parish life before entering and of that 45% participated in youth ministry or youth group, 25% participated in Catholic Campus Ministry or a Newman Center and 25% participated in World Youth Day. Finally, 88% of the professed shared that they had prior ministry experience most commonly with liturgical ministry. · 82% report someone encouraged them to consider a vocation to religious life including parish priests, friends, and religious brothers and sisters. Alternatively, 74% discourage the professed from considering a vocation by one or more persons including parents and family. · Responding religious knew the members of their religious institute 4 years before entering the institute and 20% were sponsored or worked with the institute prior to professing. In sum, the newly professed are now older, primarily educated in Catholic schools, encouraged to consider a vocation by priests and religious and familiar with the religious institute they consider before they enter. How will we continue to connect discerners with communities? The Franciscan Friars of the Province of the Most Holy Name of Jesus, who staff 40 parishes, colleges, soup kitchens, and food centers along the Eastern seaboard as well as supporting groups in Peru and Tokyo, are among a small but growing number of religious groups accepting text-message prayer requests, reports this week’s Preaching the News via an article by Patricia Reaney for Reuters. TEXT the Franciscans: They'll pray for you. Their “Text a Prayer Intention to a Franciscan Friar” initiative, described as “faith at your fingertips,” offers a novel way for Catholics to connect with those in religious life. “People are always saying to friars, ‘Can you say a prayer for me?’ or ‘can you remember my mother who has cancer?’ ” said Father David Convertino, the New York-based executive director of development for the Franciscan Friars of the Holy Name Province. "A lot of people text everything now, even more than email, so why not have people have the ability to ask us to pray for them by texting," Convertino said. The intentions are received on a website and are included collectively in the friars' prayers twice a day and at Mass. A number of communities accept prayer requests on their websites. Are there more out there who accept texted requests? It's National Vocation Awareness Week and Vocations are Thriving! This week is National Vocation Awareness week and a lot of parishes are doing their part to encourage parishioners to pray for young men and women to consider becoming a priest, deacon and religious brother and sister. SISTERS of the Visitation, Tyringham, Mass. Actually, the USCCB are having guest blog posts by young priests and religious on their pursuit to the vocation and how they were prayed for and encouraged by God and others to live the consecrated life. Let the beautiful words of Archbishop José H. Gomez be our prayer during this National Vocation Awareness week; "Every priest is a sacrament — a sign and instrument that brings men and women to the encounter with the living God. So in this Year of Faith, we need to refocus ourselves, especially in our families, on helping men to hear this beautiful and noble calling from Jesus.” (Shared from his November 2012 Tidings article). “To love another person is to see the face of God” is one of the most powerful lyrics that resonate from watching the latest Les Misérables. Being a musical theatre lover all of my life, I was highly anticipating the release of Cameron Mackintosh Ltd.’s production filled with a star studded cast. Having seen the Broadway production ten years prior, one might say I was a fan already, but what happened to me during the 157 minutes in the movie theater made me very proud to be a Catholic where God’s unconditional forgiveness is infinite. Victor Hugo’s masterpiece novel has successfully reached many audiences through his written work as well as many theatre and motion picture audiences. The musical by Alain Boublil and Claude-Michel Schönberg, with lyrics by Herbert Kretzmer under the direction of Tom Hooper highlight many Catholic themes present in this historical French story. The overwhelming theme of forgiveness and redemption I felt at this viewing of Les Misérables reminds me of the The Parable of the Unforgiving Servant found in the Gospel of Matthew chapter 18. “Then Peter approaching asked him, ‘Lord, if my brother sins against me, how often must I forgive him? As many as seven times?’ Jesus answered, ‘I say to you, not seven times but seventy-seven times.’” (Mt 18:21-22). This is poignantly seen between the Jean Valjean (Hugh Jackman) character and the Bishop Bienvenu (Colm Wilkinson) who is the first person to show him kindness after his 19 years of prison. Even after this compassion, Valjean steals silver from the Bishop and is arrested, but again, the Bishop forgives and shows love and compassion for him and tells the authorities he gave Valjean the silver. This short scene between the Bishop and Valjean encapsulates this theme of forgiveness, love, compassion 7 times and 77 times over. Other Catholic reviewers are split. Anita Crane of Catholic Lane said in her title that the movie experience “provokes mixed emotions in a Catholic viewer” from the musical being “mediocre” to the film makers “exploiting characters” and yet later shares that “In my heart of hearts, I hope it [the movie] inspires people to love God and care for orphans.” Where Joseph McAleer of Catholic Review, promotes the film stating that, “this faithful adaptation of the Victor Hugo novel, which was transformed into a worldwide stage sensation by impresario Cameron Mackintosh, is a deeply moral story. Characters rise and fall calling on God for grace and mercy, seeking personal redemption while trying to better the lives of others.” Both very interesting and different Catholic perspectives on the film worth reading. They and I agree it is not really appropriate to bring your children 13 and under due to the suggestive sexual content, violence and adult themes. However, what Catholic themes came to mind for you? What is your review of Les Misérables? Did you feel the “Fight,” the “Dream,” the “Hope,” or the “Love,” the movie poster suggests? This film reminded me of how utterly blessed I am to be forgiven by God in spite of and despite my sins. With this gratitude, I too try to forgive like the Bishop forgives Valjean in his sin of desperation. The Augustinian Sisters of the Mercy of Jesus order was founded by Canon Peter John Maes in 1842. The sisters were to offer assistance to him in his ministry to the mentally ill. Today the sisters run four care facilities throughout the U.K. Their most ambitious project was the St. George’s Park Retirement Village. The award-winning development includes senior apartments, community building, restaurant, bar, shop, hairdresser, library, gym, game rooms, treatment facility, and lush grounds with a lake and park. Sr Mary Thomas trained as a general and psychiatric nurse and has spent all of her religious life caring for the sick and elderly. When she was appointed Superior of the Order in the 1990s, she began to realize the sisters’ dream of an innovative new assisted living and care community. For more on the Augustinian Sisters, read their online listing in the VISION community directory.